Earlier this summer, we broke a story that Bandai Namco was getting “Pac-Man Fever” again as they announced the creation of Pac-Man’s Pixel Bash. 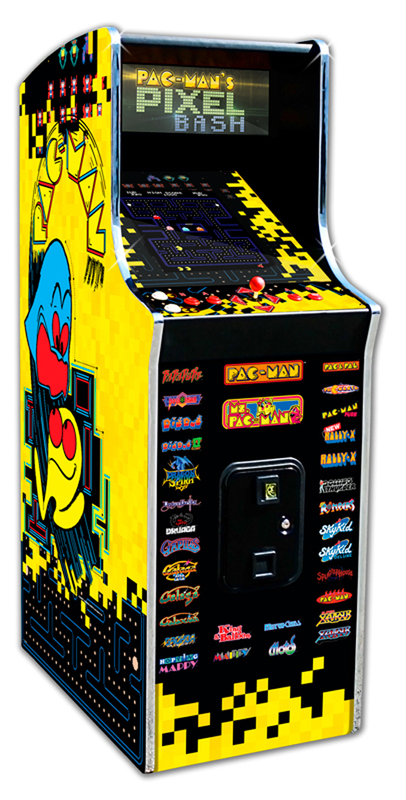 This game is the latest in a long line of Pac-Man themed multigame compilations produced by Namco, Pixel Bash standing out for including more Namco arcade classics in the package than any other official arcade production. With other Pac-Man units, Bandai Namco has always offered a few different models to choose from. They generally have only created one coin edition, while they increase the selection for the non-coin/residential versions. 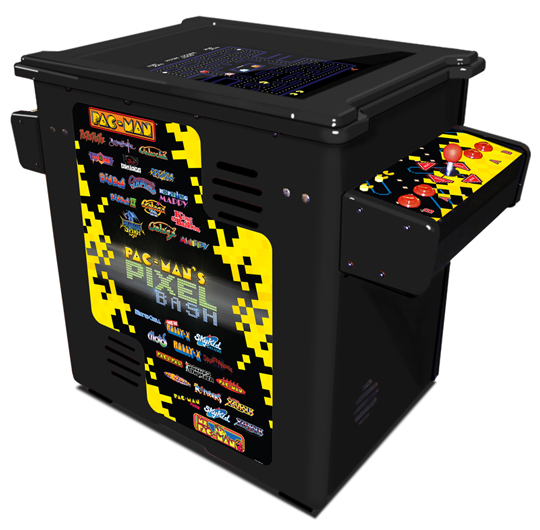 With Pixel Bash, the “Chill” version of the game was announced last month, bringing a distinct “man cave” design to the mix, replete with a mini-fridge and cup holders. Today, we have a look at some other variations that home users in particular might be interested in. 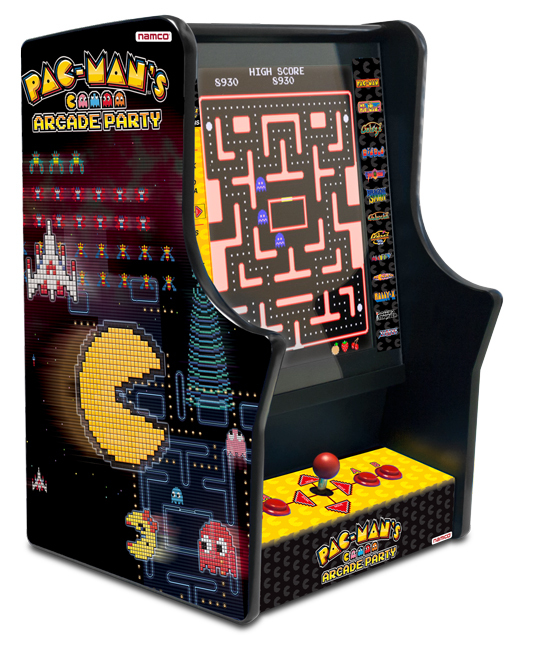 As a note, all of the units below are non-coin; all non-coin models have 19″ LCD monitors, while the coin model gets a 26″; they also feature the same software package with 32 games (Ms. Pac-Man included). First up is the cabaret model. Cabarets enjoyed popularity back in the early 80s, but except for releases like this one, they are unheard of anymore. If you aren’t familiar with this style, it’s a smaller version of an upright machine, finding a solid appeal with kids. This one also has a fake coin door on it for aesthetic purposes. Another type of cabinet that is somewhat unusual to find these days, although we’ve seen more games go this route than the cabaret one. The Pixel Bash version does screen flipping for 2-players and is available in a wood grain or black finish. One nice little surprise was the return of the bartop. It is possible that you’ve seen bartop Pac-Man games for sale out there as the 25th Anniversary Edition of the Pac-Man/Ms. Pac-Man/Galaga arcade machine had a bartop edition. I think there was one out there that offered coin-op play, but they aren’t something I see very often. For this new bartop, it is using the older Arcade Party name and software package, meaning that it is only 13 games instead of 32. But, this features the Big Three (Pac-Man/Ms. Pac-Man/Galaga) and a few other favorites like Dig Dug & Xevious. Would any of these units interest you for your home game room? That “Bartop” case sounds good, because playing on a bar chair is comfortable. “Bartop” and “Cabaret” cases are completely new to me. Thanx for the info. That feels like a pretty slimy thing to be stuck with a smaller screen if you’re getting the home version. I wouldn’t waste a second swapping that out to be on a level playing field, unless they went so far as to change the cabinet’s dimensions as well. I think I should discuss this detail with collectors and see how they feel about this. I must say that I do like that this is getting a decent cocktail cabinet since we haven’t played these games on one in ages. I’m not sure I like the bartop at all because one cardinal sin is putting the screen right in front and not having a tinted glass to help it’s presentation. Yes, I think the cocktail table is the most interesting version for collectors. In reality, players should have a well trained back to hold that body position. Yes. There was a coinop bartop version of the pac-man cabinet. I had my eyes on it but never bought one. I tried looking for one again a couple months ago. They aren’t for sale anymore. i have the above Pacman Pixel Bash Cocktail Woodgrain Table game I need to sell. It was a prize in a drawing and I couldn’t accept a cash equivalent, so I had to take this. i live in a 1 bedroom apartment and when it arrived ,I found out it is way too big for my place. I live in West Virginia (the state, NOT western Virginia) so it would have to be picked up locally. I literally just received this last Monday (9/17/2018) and only took off the boxing to test nothing was damaged during shipping and to test the games. It is still on the skid. Please SERIOUS INQUIRIES contact me via mtw1975@comcast.net.